Law Offices of Joshua L. Goldstein, P.C. – Attorney Goldstein has the strongest Immigration Law Firm website in Boston According to Google. In 2016 he moved to Los Angeles to open a new practice in downtown Los Angeles. Attorney Goldstein, at the advice of his then SEO company, launched a new Los Angeles firm on a new website. After about 18 months the new website https://immigrationlawyerslosangeles.com was not ranking well in Google. 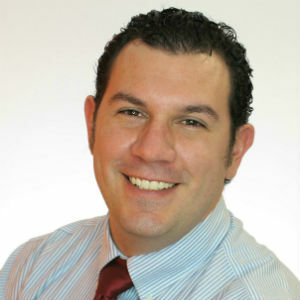 Attorney Goldstein hired Online Business Creators to help increase his rankings in Google. 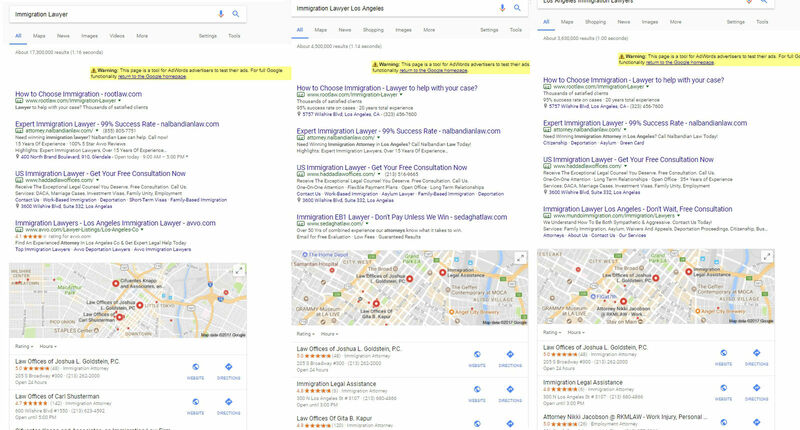 Our goal was to get his website on the first page of google for searches in Los Angeles – the follow searches were our primary focus: “Immigration Lawyer Los Angeles”, “Immigration Lawyer”, “Los Angeles Immigration Lawyers”. 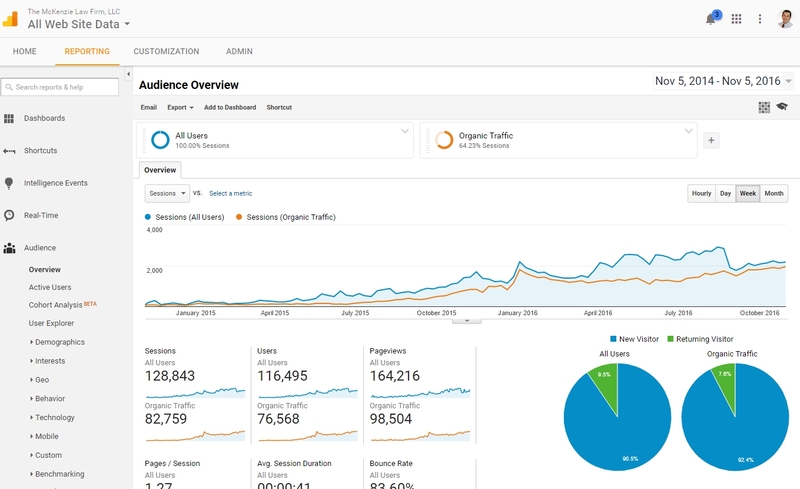 Online Business Creators ran a very specific 3 month SEO Link Building Only campaign utilizing one of our proprietary White Hat link building strategeis. At the end of this campaign, immigrationlawyerslosangeles.com was ranking on the first page for all desired keywords. Screenshots are from isearchfrom.com. TheMcKenziefirm.com – Attorney McKenzie was not getting enough website traffic and hired Online Business Creators to help him grow his practice. We rebuilt his website and ran a large SEO campaign focused on linkbuilding. When we launched the new website in January of 2015 we were averaging a little over 100 sessions per week. One year later we were averaging just under 1500 per week, an 1500% growth in weekly website traffic. 2. 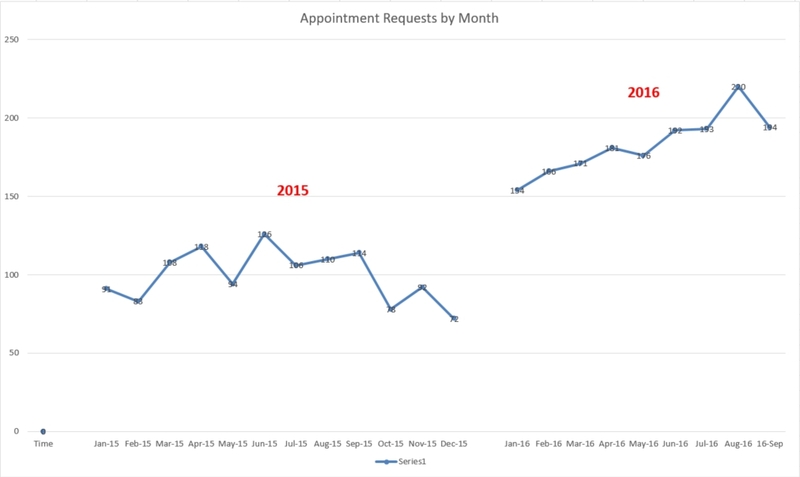 A large dermatology practice with 8 locations in 2 states had been growing but their website traffic and new appointments numbers had were stagnant. Online Business Creators was brought in to rebuild their website using SEO and UX best practices. We optimized the visitor workflow and engaged in a 40 hour per month citation and link building campaign. A new website was launched mid-December 2015 and since that time traffic has gone up 54% and new appointment requests (leads) have gone up 110%. This was done all while reducing monthly ad spend from $2000 per month to $500 per month. Screenshot below is the custom report sent over on a monthly basis with data derived from Google Analytics.